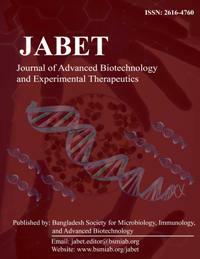 Journal of Advanced Biotechnology and Experimental Therapeutics (JABET) – is an open access, international, peer-reviewed, scientific journal publishing original research findings and reviews on all aspects of biotechnology and experimental therapeutics. It provides a platform for Scientists and Academicians all over the world to promote, share, and discuss various new issues and developments in translational research and recent discoveries in the Biotechnology and Biomedical Sciences. The frequency of publication: 3 times in a year (January, May, and September). However, articles appear online including Google within 7 days of acceptance. Publication scope: Submission is encouraged of papers that involve genetic, molecular and cellular studies of human, animal, environment, and plant subjects. Detailed Scopes. 30 USD only for Journal management purposes!